sold some guns i no longer wanted yeaterday and went and bought a ruger nickel plated vequero bisley. a very well made gun except for ont heing that ruger has a fault with. the cylinder is way too tight in the front as well as the back. it loads very hard and unloads very hard. also the diam. of the front end of the cylinder is way too smal for good accracy. did i buy a bad gun? no. i just bought a gun that is very well made and i really like but i am going to have to spend another 90 dollars on in having the cylinder made right by a fellow in n. carolina who makes the loading and unloading easy and rams the front of ruger cylinders to the right size for good accracy. i dont mind the extra 90 dollars to make the gun perfect but it is sad that ruger cant do it from the factory. dont be afraid of a ruger revolver, just understand when you buy one you may have to spend some extra dollars to make it shoot really tight groups. i did the forcing cone my self but the cylinders are so tight i cant polish them out properly. so im sending the cylinder to dug guy who post on cast bullets and he will do a good cylinder job for a decent price. then my gun will drive tacks, as of now it doesnt even come close. now for the rest of the story. i made enough money off my sales to also buy a uberti colt saa black powder model with a 3 and 3/4 inch barrel. the cylinder was good both front and back on that gun and i did the forcing cone over as mine is better than their. at 15 yards i could easily take the head off a snake every shot shot after shot. thats all i want. it loads and loads easily. it like 250 grain bullets best and my loads were a little hot but the gun took them and really is a shooter. the ruger will be also but for now it is not a snake shooting gun. when doug guy from cast boolits does his work, it will be. info for you guys who want your ruger to shoot better. ruger uses their reamer ways past wearing out. if you get a gun with a new reamer it will shoot fine if it is a old reamer it wont, but now you have the answer to fix it and the reason it wont group. hope ive helped some one. I had the same trouble with a Ruger Old Army. The chambers in the cylinder were not of uniform diameter. After measuring them, I found 3 different diameters. I bought a replacement black powder cylinder from ClassicBallistx and all of the cambers were the same. They also were drilled deeper so more powder could be used if desired. Where did you get a nickle plated Ruger ? I have never seen any Ruger that was nickle plated they are blue or stainless or hi polished stainless. Did you buy it used and someone had nickle plated a steel model? at first seeing the ruger at the local ace hardware store i thought it was stainless steel. then we put a magnet to it and it was regular steel that was nickel plated as the magnet stuck on it very tightly. it wont do that on stainless steel. many handguns that are really stainless steel dont have stainless steel cylinders. the cylinders are very good regular steel that is highly polished to look like stainless steel. 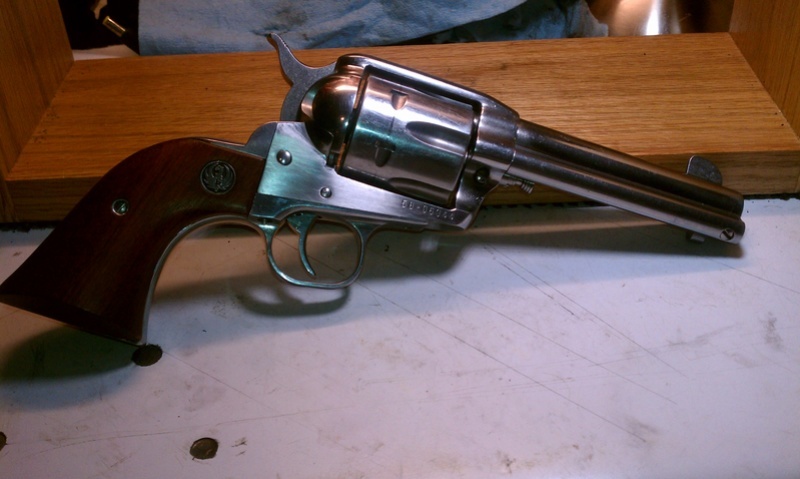 i have a really high end uberti cattleman colt that is stainless steel. a magnet wont stick to it except it sticks hard to the cylinder. the cylinder isnt stainless steel. i polished the cylinder to a very high polish after i had doug guy give that cylinder a complete back and front reaming job. then i sent the cylinder to a guy in penn. and he nickel plated it. i wanted the cylinder plated so it wouldnt be as willing to rust. that gun is a tack driver and so will the ruger when i get done with it. now the ruger isnt even close to all my uberti colts. but it will be. i really like the gun but i have to tweek it to make it shoot as it should. ruger just doesnt like to put new reamers on their machines as they start to wear out. again, i hope this helps someone to make their ruger a tack driver. they are good guns with poor drilled and reamed cylinders. I checked my 5 Rugers and my 2 S&W s, Marlin and my 4 Taurus that are stainless all are attracted to a magnet .I called Ruger and checked to make sure and they have never made any nickle plated firearm period, also told me that they are an alloy that is attracted to a magnet . I did some research and found that there are several different types of stainless that are magnetic. I dont know about the Umbertis as I only have 1 its a blue model with very soft screws. i want to thank you for your research, it is full of information. their stainless steel isnt as stainless as some stainless. the uberti stainless cattle doesnt take a magnet at all. the ruger takes it as hard as regular steel. again you research and info is just what this fourm is about,information and sharing it. again thanks. if you can add to it please go ahead. Actually there stainless is more stainless they add a few extra elements one is chromium that enhance it and also lets it be attracted by a magnet. I measured my Vaquero and all the chambers are the same, but its one of the older models Ive shot it enough if they were different they would be worn to the same size by now, wouldnt even want to guess how many have been thru it . again i want to thank you for the info. their is some tool marks around the trigger guard so im now not afraid of taking them out with needle files and 240 grit emery paper to do the finish job that should have been done in the factory. the ream job on my ruger is so bad in the cylinders i can hardly get factory ammunition in the gun. where the bullet comes out the holes are way to small. the rest of the gun is built very well except for tool marks on the finish which i can remove and polish out. those God awful plastic white grips have to go and i ordered plain rosewood grips for it. when the cylinder is done right it will be a good gun. 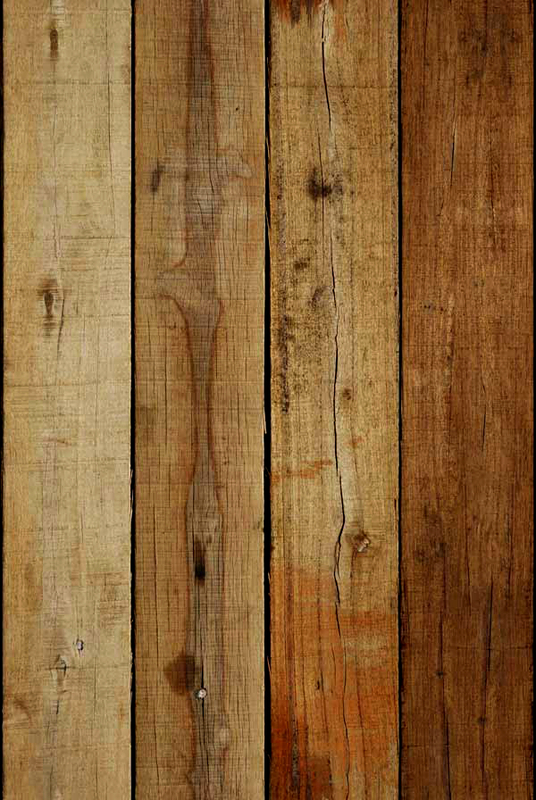 I need to do some slicking up on my Vaquero its got lots of scuffed up places from lots of use. mine came with the wooden grips, but also have a set of white ones. Heres a couple of pics of my Vaquero with both sets of grips. I like those white ones. Back about 1975 or so I wanted a genuine ivory set for my Colt SAA. I priced them and they were expensive but not ridiculous. But, being a tightwad, I put it off. Of course, I kick myself now for not getting them back then. I have never liked any of Rugers stock wood grips seem to thin to me my white ones are just a little thicker but it makes a difference to me . I had a set of oversized ones on a Super Blackhawk 44 Mag years ago that tamed it down to where I could manage 75-100 full bore loads before my hand gave up. thats a nice ruger. i got some rosewood grips from houge yesterday. and i oiled them and polished them up on the buffing wheel and they really look nice. they fit perfectly with out any adjustments. they are thicker also than the ruger grips. they were my first houge grips. i also ordered some grips from dixie for the uberti colt and they should be here soon also. hope they fit as good as the houge grips did. i will say one thing about ruger stainless steel, it polishes up a lot easier than the uberti stainless steel does. also goes to a higher luster with ease. also through a lot of research all over the internet i found out if you have a tight chambered ruger like i do that copper jacketed bullets shoot best in them. i found a box and they do shoot pretty good as to lead bullets. im still going to get the cylinder worked over front and back. i contacted the man who does it and he gave a price so im saving my change and am half way their. i never ruin my wifes budget with my toys. some how i find money as i have a lot of extra things i do not need or use and i find someone who wants what i have to sell.i find i like my toys better when i have to work for them and not have them layed in my lap. thanks for showing your ruger. took all the tool and machine marks out of the area around the triggerguard, polished to a high polish. it is something they should have done at the factory. after i get the tuned cylinder back and settle in on the type of ammo i will load for it i will start slowly honing the front sight down as it shoots very low now, it shoots to center but very low. it is starting to become a decent revolver. I stopped by the local gun store yesterday. He had a SS 7 1/2" barrel Ruger Old Army for $450. I didn't check the bore out but it looked in good condition. He said he wouldn't take less. I already have 3 Old Army revolvers or I probably would have bought it. if your talking about the percussion, you wont loose any money. 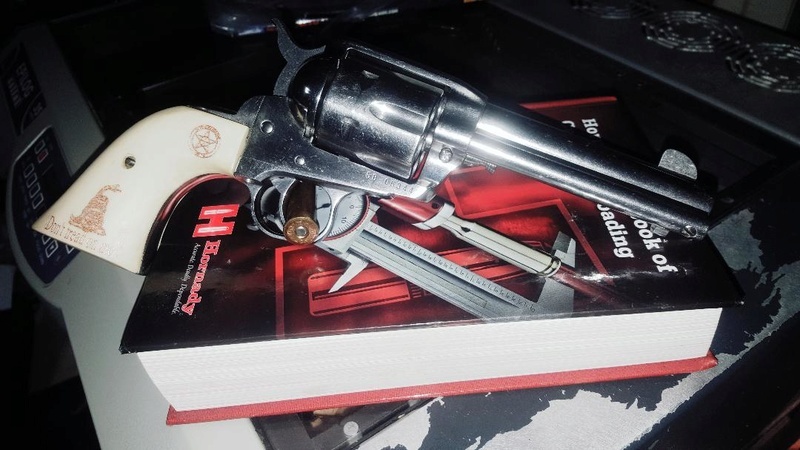 if you got a howell conversion cylinder it turns it into a very good 45 long colt. i had a ruger old army with a conversion cylinder. i could reload it as fast or faster than a colt saa army. it shot holes in holes. i sold it to a ruger lover from penn. he emailed and said he like it better than any of his other rugers and it was his main walk about gun in the woods. if you buy it you wont loose money on it. I just sold a 3.75 inch Ruger Vaquero now wish I wouldn't jumped the gun, really handy size and shot as good as my 7.50 inch at 25 yards. i agree about the 3.75 length barrel, of all my uberti colts, the one i have in that barrel length is my favorite. hits as good on my man target as the 7 and 1/2 inch barreled ones. feels really good in my hand. my friend says its his favorite also of all my handguns. im going to get a good cross draw holster and use that one to take the test with to carry a hand gun here in nebraska. its really loud though so i have to use ear plugs when i shoot that one. a ruger vaquero in 3.75 barrel length, that would be a good one. Yes, 3.75 inches of pure hell. to day i shot my bisley at 20 yards. it has to go to the cylinder man for a cylinder hole job. probably next week. 5 shots were acceptable but not as tight as i like. one cylinder hole is so tight that the bullet was so undersized that it was impossible to hit anything with that cylinder. even the backside of that cylinder is so tight it is hard to get store bought ammo into that cylinder. with the new rosewood grips and all the machine marks polished out of it i like it. now i have to get the cylinder honed so it shoots. its too bad that ruger cant send them out of the factory with a decent cut cylinder. the gun will be a very very good gun but not out of the box. When all cylinders are the same diameter that lets you adjust the sights and then your going in the right direction. It doesn't matter whether its black powder cartridge or modern stuff, same idea applies for all of them. just got the cylinder back. loads and unloads easily. shot at 15 yards at a point in the snow and grouped in one tiny tight group off hand to point of aim with the sights as they are. now i have a really good gun. too bad they dont come from the ruger factory that way. im not sad about that, just glad i have the knowledge to know what to do about it.